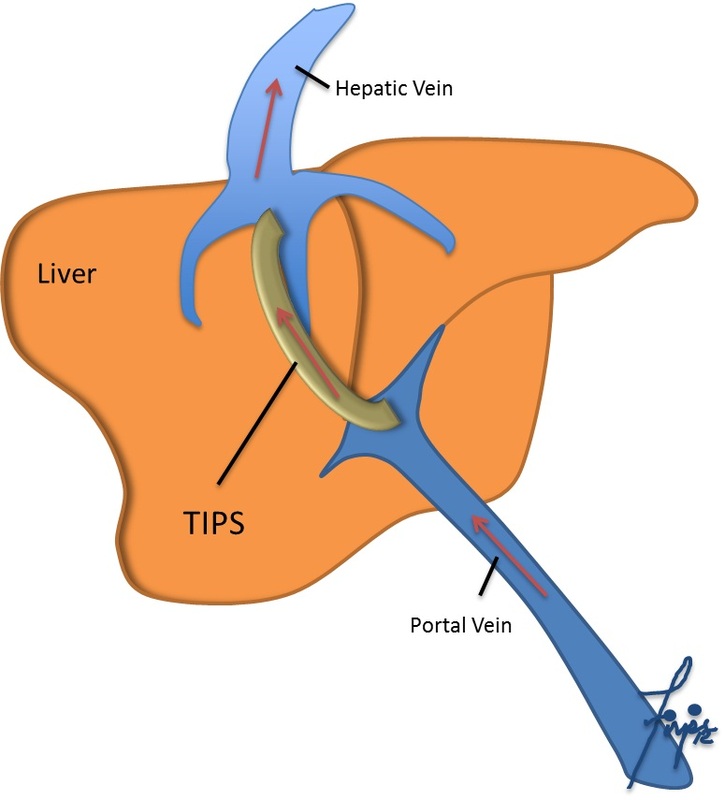 TIPS is a shunt or a bypass use to connect two veins within the liver with the use of x-ray by interventional radiology. This tract is what we call a Transjugular Intrahepatic Portosytemic Shunt or simply abbreviated as TIPS. See the “yellow” tract on the picture to your left. When is TIPS procedure indicated? TIPS is indicated to treat patients with portal hypertension (variceal bleeding, portal hypertension gastropathy and severe ascites) and in some cases in Budd-Chiari Syndrome. How to prepare for my TIPS procedure? The night prior to your procedure, do not eat any food or drink any liquid. However, you may be allowed to drink clear liquids to help you on the day of the TIPS procedure. It is well advised to take your morning medication as instructed by your physician and to stay in the hospital for 24 hrs for observation after the procedure. 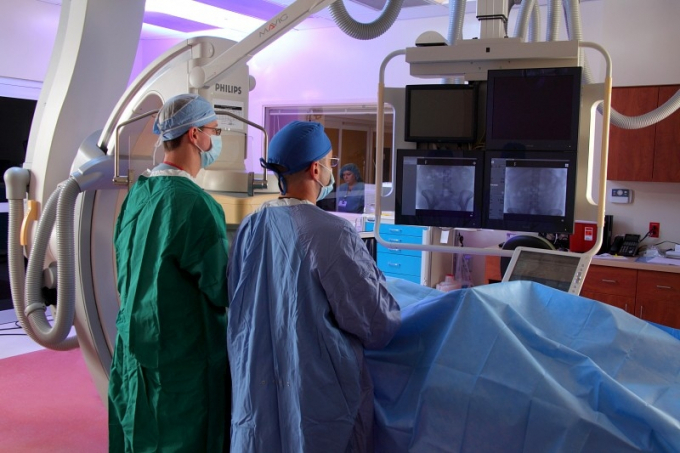 This procedure will be performed by an interventional radiologist that will use an image guided approach to create an artificial tunnel within the liver to connect the portal vein to the hepatic vein. A stent is then placed to keep the pathway open. The TIPS procedure can be performed under general anesthesia to avoid you feeling any pain that they could possibly feel while the procedure is being carried out. You will be positioned on your back, connecting you to monitors where your blood pressure, pulse and heart rate will all be traced while the TIPS procedure is being conducted. Prior to the TIPS procedure itself, you will be prepared by the nurses by having an intravenous or IV inserted. The specific area of your body where the catheter will be inserted will be shaved, sterilized and covered with a surgical drape preparing you for the start of the procedure. The upper part of your right collarbone will be numbed with a local anaesthetic before a small cut is made in the skin at the site. With the use of ultrasound, the specialist will identify the patient’s internal jugular vein and guide a catheter into the vessel towards the liver and into the hepatic vein. To confirm the diagnosis of portal hypertension and its severity, pressure is also measured within the right side of the heart and in the hepatic vein. A contrast material will be injected into the hepatic vein to help place the TIPS stent and to identify the portal venous system. 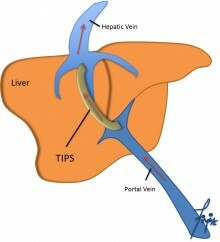 An entry is then gained from the hepatic vein into the portal system using a TIPS needle. The stent will be placed under the fluoroscopy extending from the portal vein into the hepatic vein. Once the stent is properly placed, the balloon is inflated, expanding the stent into place. The skin will then be covered with a bandage leaving you with no need for sutures. Close follow up observations are needed after your operation which will be conducted within the hospital. What are the complications of TIPS? Hepatic encephalopathy or confusion- This is a condition were you have altered mental status which it is believed to be due to toxic products from the intestines (ammonia). This ammonia is normally removed from the blood by the liver. When TIPS is performed, the TIPS will allow toxin-containing blood with ammonia to bypass your liver. This may affects your brain in a way that may cause confusion or even comma. Different treatments can be use to treat this condition. Heart failure- This is due to the increase in the amount of blood returning to your heart through the shunt or TIPS. The heart may be unable to return blood fast enough back to your body and it may cause heart failure. If you have history of heart failure notify your doctor before having the procedure.